While not true all of the time, many popcorn textured ceilings that were installed in the 19070’s and 1980’s contain asbestos. 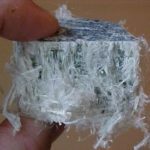 While asbestos is a highly versatile material used in countless applications, it is also toxic. Asbestos has since been identified as a cause of a certain type of cancer called mesothelioma. This is the most important reason why you should never ever attempt to remove old popcorn ceilings yourself. Not only would you be potentially putting yourself at risk, but also any other living thing in your home. Even if your popcorn ceiling does not contain the toxic material asbestos, removing it can prove to be a nightmarish ordeal. How so, you might ask? If your popcorn ceiling has ever been painted, even just once, removal is very difficult for all except the most seasoned professionals. Popcorn ceiling must first be moistened with water to make it easy to remove. Paint that is applied over the texturing makes it extremely difficult for water to penetrate into the ceiling. This would make for a very hard time trying to remove it. This is best left to a drywall contractor. You are free to try, once you are certain your popcorn ceiling is asbestos free, but be warned that it will be a very difficult task. Your very best solution is to call your local Popcorn Ceiling Repair Company for pro assistance. Not only would they likely have the expertise, but also specialized tools that you most certainly do not own. There is an easy way to test your popcorn ceiling to see whether it has been painted before or not. All you need is warm water and dish liquid. Combine the two into a spray bottle, easily obtained at nearly any supermarket or retail store. You may even have one laying around the house somewhere, so it wouldn’t hurt to spend a few minutes looking before you go off and buy one. A reputable drywall or painting contractor will know the right method to use. Go into the room with the popcorn ceiling you wish to have removed. Spray the warm soapy water onto a corner of the ceiling. Wait 2-3 minutes and check on it. Has the water soaked into the ceiling? If so, it has not been painted. If it does not soak through, it has been painted. Testing for asbestos is slightly more involved. You only need to wear a protective face mask and have a chisel handy. Simply chisel off a small bit of the popcorn ceiling. Place it into a Ziploc bag and check with your local EPA to send it in for testing. They will be able to tell whether it contains asbestos or not. Are you still unsure about the process? Contact your local popcorn ceiling removal service. 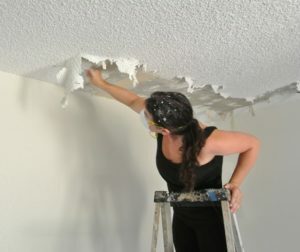 Of course, you can make things much easier on yourself simply by letting professional popcorn ceiling removal specialist provide the service for you.